Today: Hsiao-Ching Chou of Chinese Soul Food shares her mother's recipe for pan-fried dumplings. 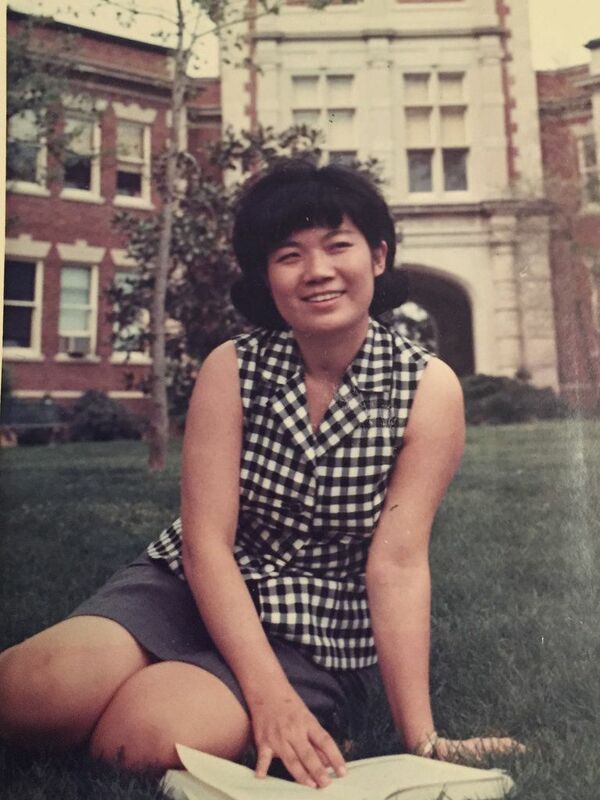 Left: Hsiao-Ching's mother sits on the grass at the University of Missouri, where she went to graduate school. I have been making dumplings at my mother’s side for the past thirty years. I first learned how to fill the wrappers and pleat them shut when I was in grade school. In my teens, I learned how to make the dough and roll the skins. Before I graduated college and left home for my first job, I had to be able to make a batch of potstickers (pan-fried dumplings) from beginning to end as a test of my skills—and to reassure my father that, some day, when I met my future husband, I would be able to feed him. 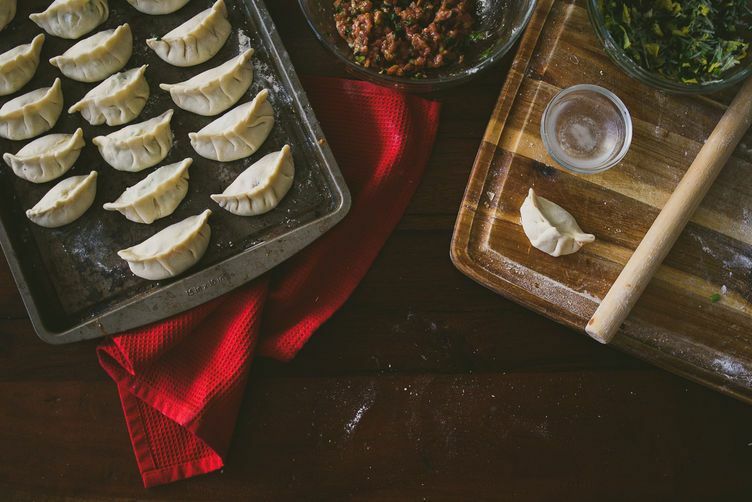 They weren’t pretty in the beginning, but my technique evolved over the years; thousands of dumplings taught my fingers the nuances of the dough. 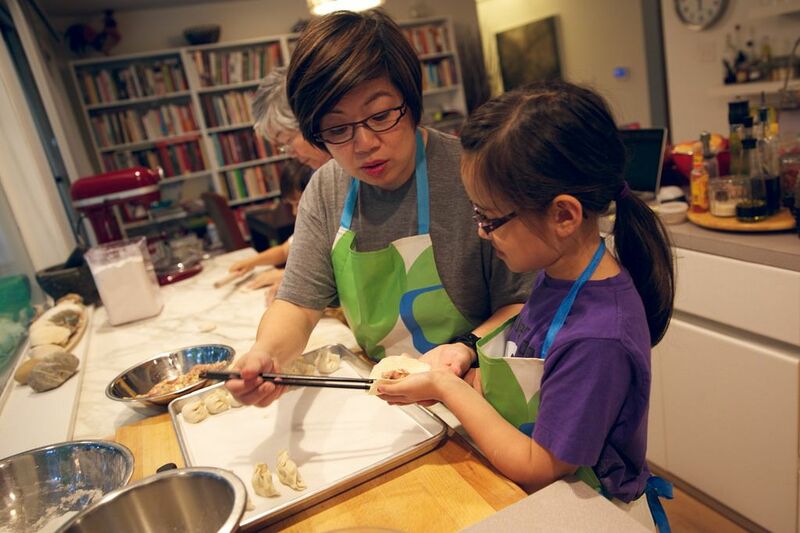 Right: Hsiao-Ching teaches her eight-year-old daughter, Meilee, how to pinch together dumplings while her mother rolls out the dough behind them. Ironically, when my mother was young, she was seldom allowed into her family's kitchen. My grandmother had not been educated and wanted her children to focus on their studies instead of on household duties. It was only at the Lunar New Year that my mother made dumplings with her siblings and extended family. And it wasn’t until after she got married that she began to make dumplings regularly for my father, who loved them boiled, steamed, and pan-fried. My mother's dumpling recipe is fairly universal. The forgiving dough consists of just flour and warm water. The filling is usually ground pork and Chinese cabbage or chives. 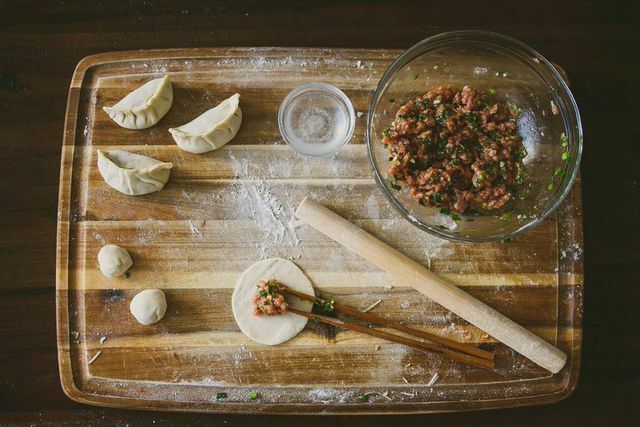 My mother says that Chinese people seem to be born with the ability to make dumplings—it’s just part of our cultural DNA. I, on the other hand, would say that it’s a part of our cultural identity to love eating dumplings of all sorts, but making them with any dexterity and efficiency requires many years of practice. 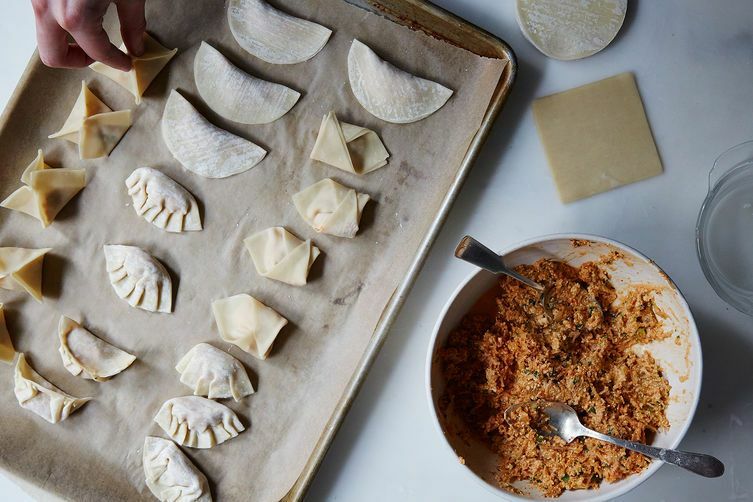 More: Make the dumplings of your dreams—without a recipe. Even after I moved from home to Seattle to follow my career as a journalist, I made an effort to visit my mother regularly and make potstickers. We also form an assembly line: Her job, to this day, is to mix the dough and roll out the skins into uniform rounds; mine is to fill and pinch the skins into dumplings, then pan-fry them in a skillet until the bottoms form a crunchy crust. Elbow deep in flour and dough, we chat about everything. While the particulars of most of our conversations have ebbed into oblivion, the time spent with my mother has been invaluable. My father’s prescience also proved correct, as the man who would become my husband fell in love with me over conversations fueled by my cooking. These potstickers have also made my mother and me somewhat famous. We have taught a few cooking classes and given demonstrations at events. I was on an international television program showing the host how to make potstickers. One of our local NPR stations interviewed my family for a Lunar New Year story that brought the sounds stir-frying postickers to listeners everywhere. Tens of thousands of dumplings have passed through my mother and my hands, and the story of our lives has been folded into every pleat. Click here to view the whole recipe (and save and print it). Hsiao-Ching Chou is the author of "Chinese Soul Food: A Friendly Guide for Homemade Dumplings, Stir-Fries, Soups and More." She lives in Seattle with her family. Text her cooking questions via her messaging service: 206-565-0033. This sounds delicious and simple. I will make these with my nephew this weekend!